Combo Bounce Rentals | A&T's House of Bounce Inc. 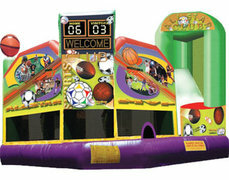 Looking to add a little more excitement to your bounce house rental? Rent one of our exciting Combo Bouncers. They add the excitement of a climbing wall, obstacle area, slide and some even have a basketball hoop. Browse all of the combo bounce house rentals Newburgh has to offer! Simply click the Image or the title below to see the specs on each of our amazing combo bouncer rentals. Feel free to book your combo bounce house rental online using our safe and secure check out procedure. Simply shop by date or click the "ADD to CART" Button.Then just follow the checkout procedure. 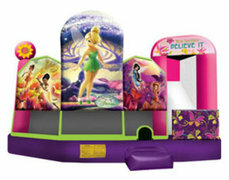 Rest assured that your combo bounce house rental is guaranteed upon leaving your $50 deposit and finalizing the order. We are the Hudson Valleys premiere party rental and event company. Our heavy duty combo bounce houses provide hours of fun for kids of all ages! We have even seen a few moms and dads playing in them. Take advantage of the spacious jump area, combination obstacles, rock climb and slide. Our Mega Combo has our largest jump area and slide. It is sure to be a hit with the older kids. If you are planning a party for the little guys 8 and under, you should check out our Fire Truck Combo which is sure to leave the kids wanting to slide down the firemens pole at the local fire department. Take advantage of the many reasons to book your combo bounce house rental with us. We will work with to plan your party while making it a stress free and enjoyable experience. Let us help you to find the perfect combo bounce house rental Newburgh has to offer. 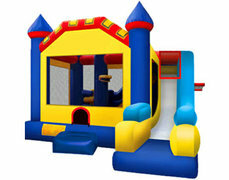 See why our clients Choose A&T's House of Bounce For Combo Bounce House Party Rentals? www.HouseofBounceNY.com has been providing exceptional Combo Bounce House Party Rentals in Newburgh and its surrounding cities since we incorporated in 2014. We are family owned and we supply party rental equipment throughout the Hudson Valley including Orange, Rockland, Ulster, Dutchess, Putnam Weschester and parts of Sullivan County. We offer unmatched customer service through phone, text, email or chat from 8am-8pm all week long. Saturday and Sunday take precedent to the days rentals, however a cell phone number is given for urgent matters. 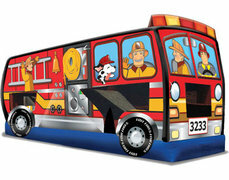 Once your Combo Bounce House rental has been set up, it is time to get the party started. You can take comfort in knowing that our high quality combo bouncers are made with lead free fire retardant vinyl. All of our combos have a small doorway with safety netting and a large entrance pillow to keep kids safely inside the unit. They all come with large mesh windows which helps airflow through the unit, keeping your guests cool and allowing visibility for the parents. All of our units have a safety hatch built into the roof in case of unwanted deflation. 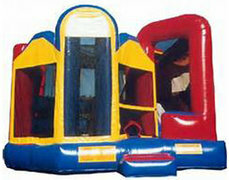 We offer our Combo Bounce Houses at affordable pricing that won't break the bank. We understand that parties can get expensive which is why we price our rentals competitvely and fair to make renting a combo bounce house easy on any budget. Reserving your Combo Bounce House is easy with our new automated online ordering system. It is as easy as shopping on Amazon and we can sometimes get you your Combo quicker than prime! Simply click through our categories and when you find the perfect party rental, simply click "ADD to Cart". Once finished shopping you can finalize your order through our secure check out process. Our Combo bounce houses all come with FREE local delivery and set up for any party rental within a 15 mile radius of our warehouse. There is a small delivery fee for party rentals outside of our FREE delivery zone. We deliver to Orange County, Ulster County, Rockland County, Dutchess County, Putnam County, Westchester County and parts of Sullivan County. You can find a full list of cities on our Delivery Area Page. If you do not see your city in our list, please feel free to contact us through, chat, email or phone.